Being a railfans who grew up in Surabaya and East Java, I got accustomed with the sight of narrow gauge trains traveling along the main highway in East Java. 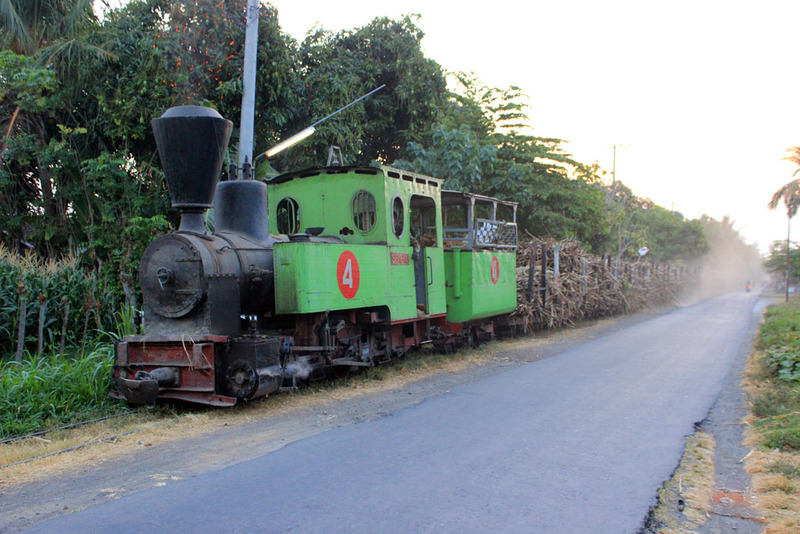 Those cute looking narrow gauge trains would trundle next to the main road while hauling the empty or loaded sugarcane hoppers. Sometime, if I get lucky, I could rode one of those empty sugarcane hoppers. Since I was a kid in a conservative and restrictive family, getting intimate with one of those things was prohibitively difficult. Railway hobby was considered as a childish hobby. 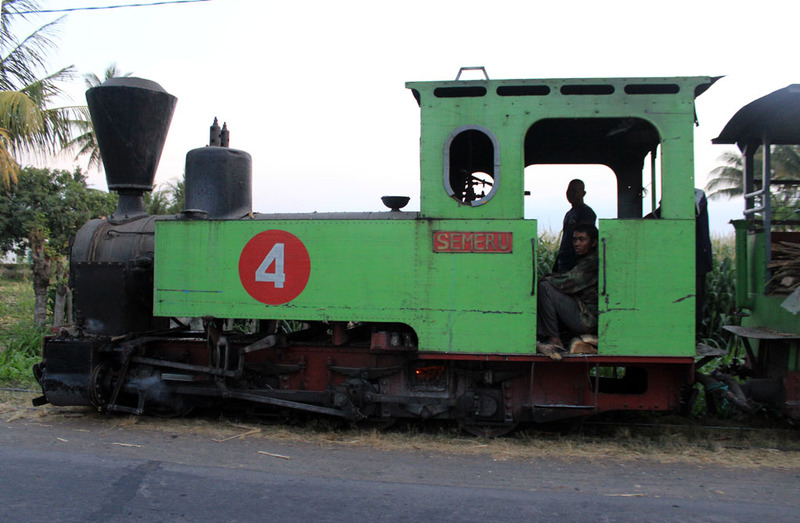 As I grew older outside Surabaya and East Java, I really missed the chance of seeing those narrow gauge trains in action. 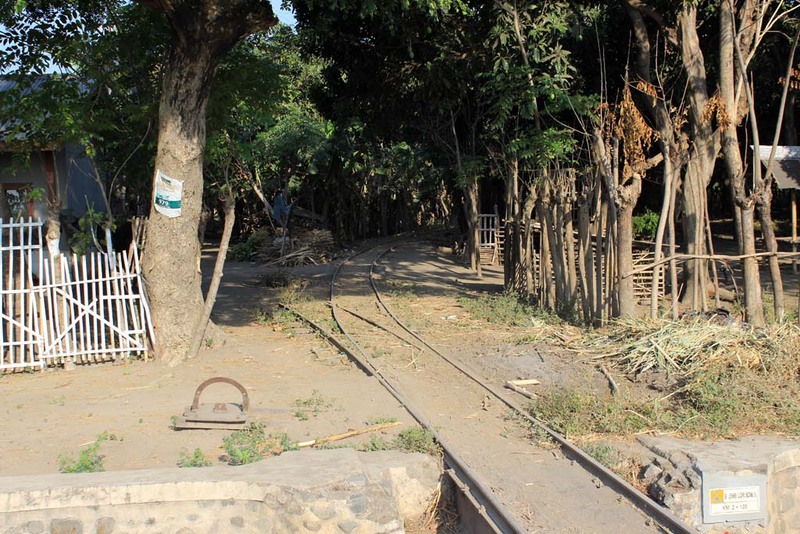 Throughout those “lost years” there were many changes in sugarcane narrow gauge train operation. Most of the mills changed their steam traction and replaced them with diesels. There are some mills that closed their field lines, and leaving their motive powers used solely for shunting. Even worse, some mills disposed their railway system and replacing them with road vehicles. And in some worst case scenario, the mill itself is closed completely. 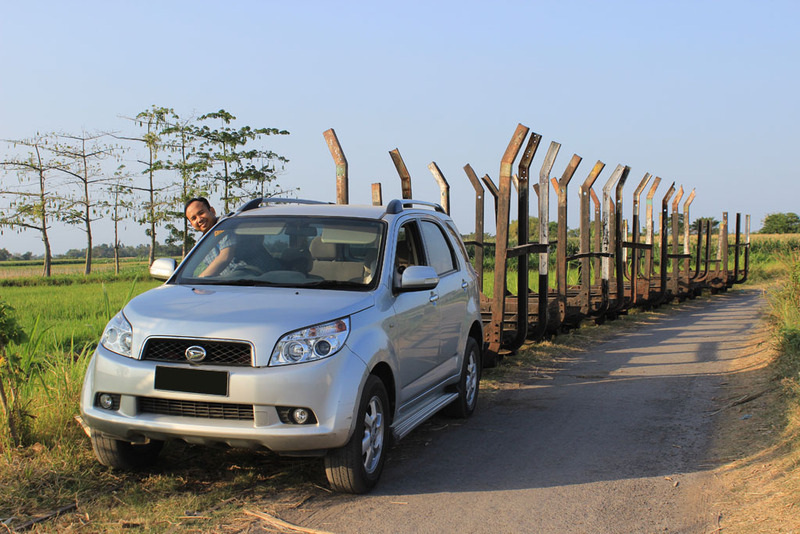 My interest in narrow gauge sugarcane trains only began in 2012, when I accompanied some tourists visiting sugar mills in Klaten (Gondang Winangun) and Tasikmadu. 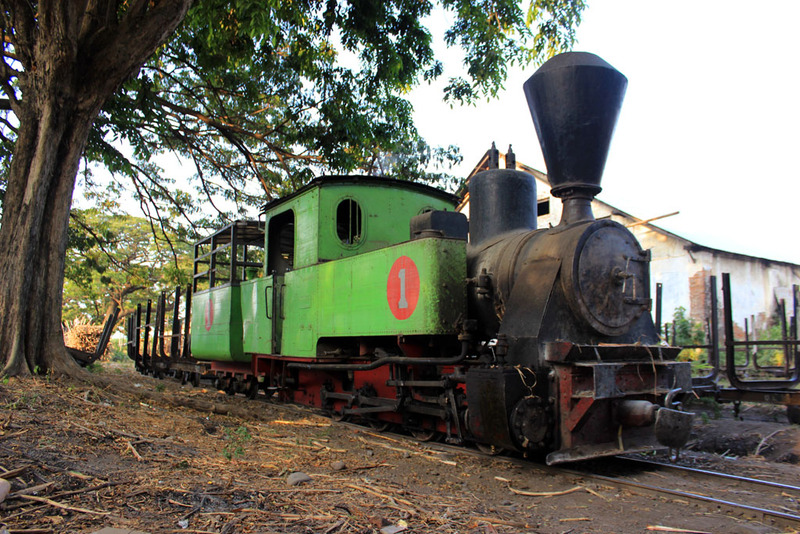 Expecting to see sugarcane trains in full action, I was quite disappointed upon finding that their narrow gauge train operations have largely been reduced into shunting operation or tourist train inside the mill’s compound. Unsatisfied with that, I began to do my research about narrow gauge sugarcane trains operation. It turned out that some mills still operating their field lines. Some have even using them for their field lines. 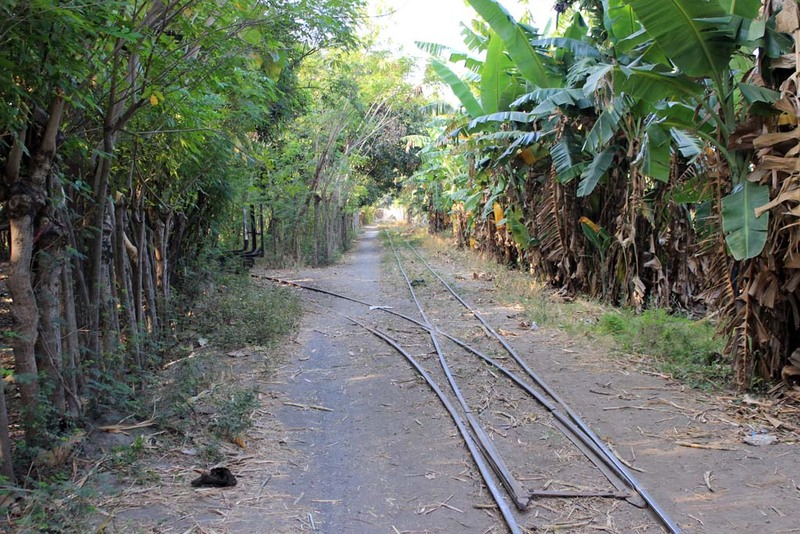 In the end, I found that there are only two sugar mills that still operate their steam locomotives for field lines working: Sumberharjo in Pemalang, and Olean in Situbondo. Since the first is out of reach, I decided to visit the later. After several delays, I eventually went there with my friend from Jakarta: Agra. We departed in the morning of so-called “Railway Day”: 28th September 2013. This is the first time I drove over a long distance in East Java. It’s not as difficult as I expected, although we drove through a hot day, queuing with slow paced trucks. 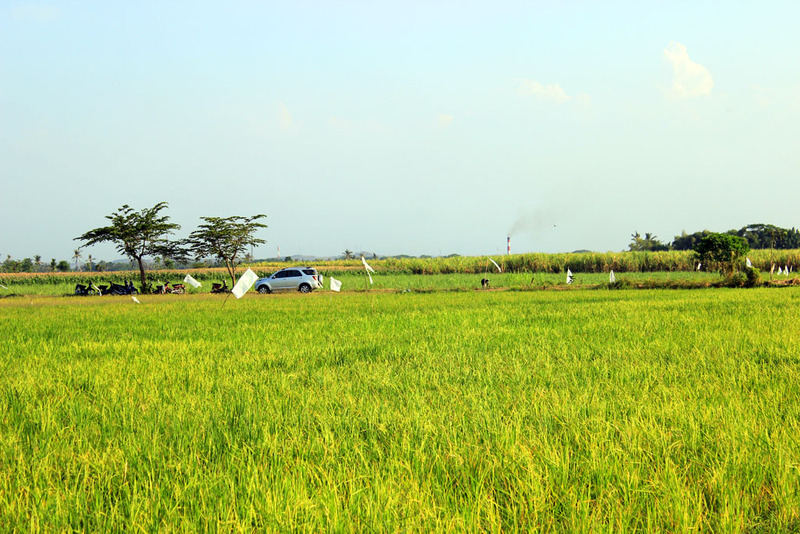 Upon arriving at Situbondo area, we began to be greeted by the beautiful scenery. 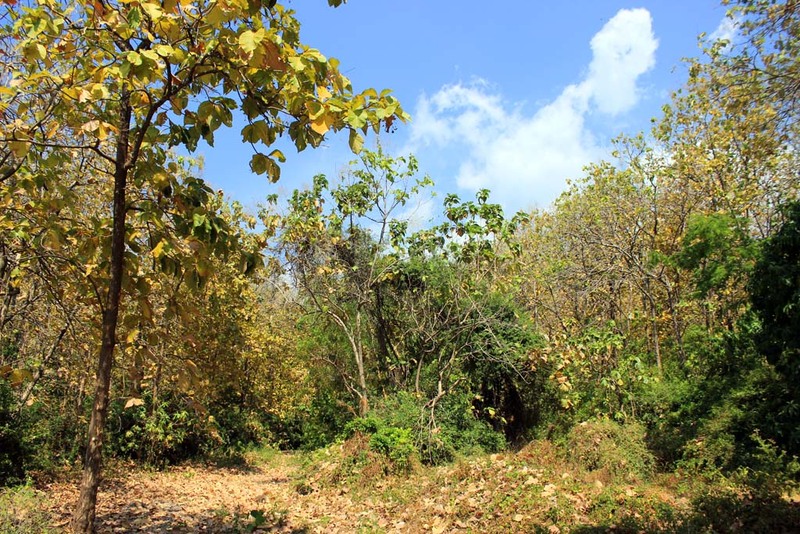 Such as this dry river in the middle of teak forest. We booked a room at Rosali Hotel. According to TripAdvisor website, it is the best hotel in Situbondo. Upon arriving at the hotel, we had the impression that the hotel is not a really a good hotel, but at least it has no rival in the area. Upon arriving at our room, we were quite surprised to be greeted by rancid toilet smell, humid room, and damaged TV remote. But thankfully, all of those problem were ironed out quickly. We relaxed briefly in the hotel room, and leaving our luggage in the room, before heading to Olean sugar mill for some orientation. The orientation itself eventually turned into a real hunting, as we later found out. 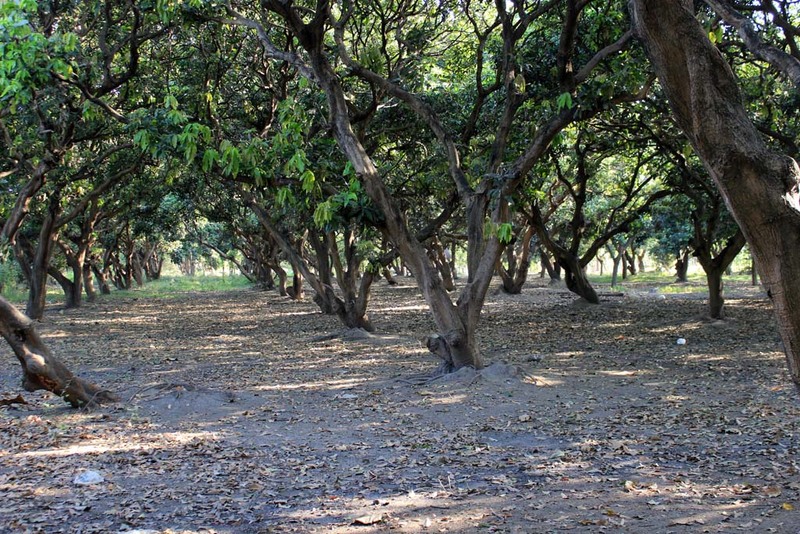 We followed the mainline to the west of sugarmill, which somehow went through mango plantation. I believe this junction was once located in the middle of sugarcane field. And more than that, this junction turned out to be a triangular junction, although one of them had been truncated. We are also exploring the area to the North of plantation, where some farmers pushing rail carrying hoppers in the middle of the field. 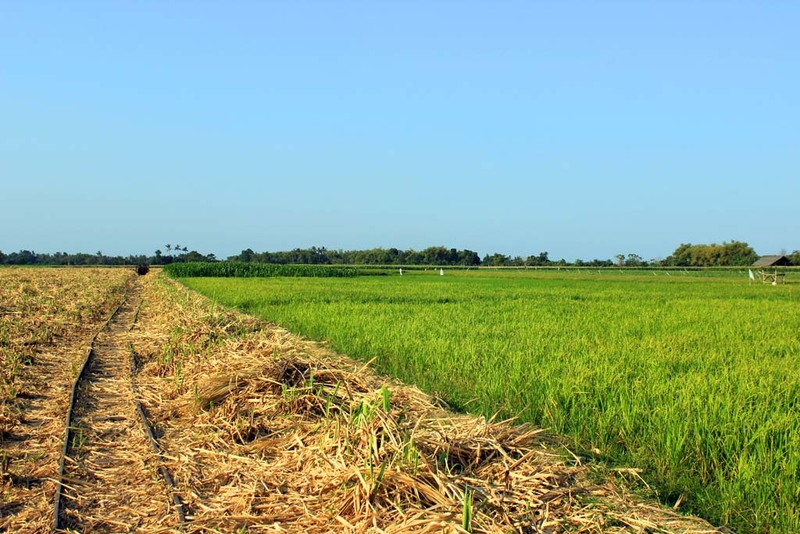 It’s quite a contrasting image, where a brownish-colored harvested sugarcane field compared to green ricefield. When I returned back, I could see the sugar mill’s smokestack in the distance. It is such a spectacular view. On the way back to the mill, we played some photo trick, where I parked my car in front of some empty hoppers to give impression as if my car acted as a locomotive. Up until that, we haven’t seen any locomotives yet, so we decided to return back to the mill to see if there are any locomotives in action. Only when we returning back to the mill, that we eventually able to see the glimpse of Olean’s last steam fleet. After asking some permission from the security, we are allowed to enter the mill site, and came across Olean number 1. This impressive looking Orenstein & Koppel locomotive is one of a few locomotives left in operation in Olean sugar mill. And unfortunately, due to its poor mechanical condition, it is now employed for shunting only. Still, we’re able to see this locomotive in action inside the mill compound. We also manage to photograph its builder plate. 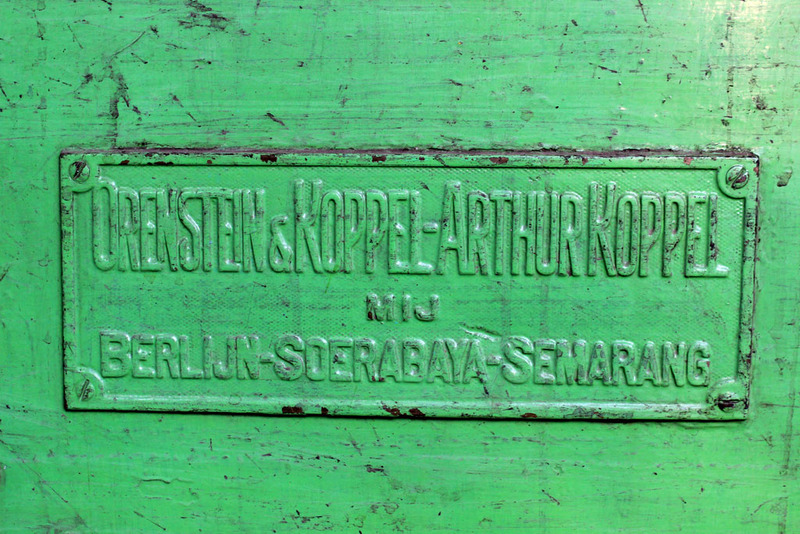 Judging by its information, I assume that this locomotive was manufactured in Surabaya. Soon afterward, we return back to our car. On the exit gate, we asked the security on the where about of the locomotives. He said that there are two on the field lines. Curiously, we decided to go to the field, although the sun began to set. 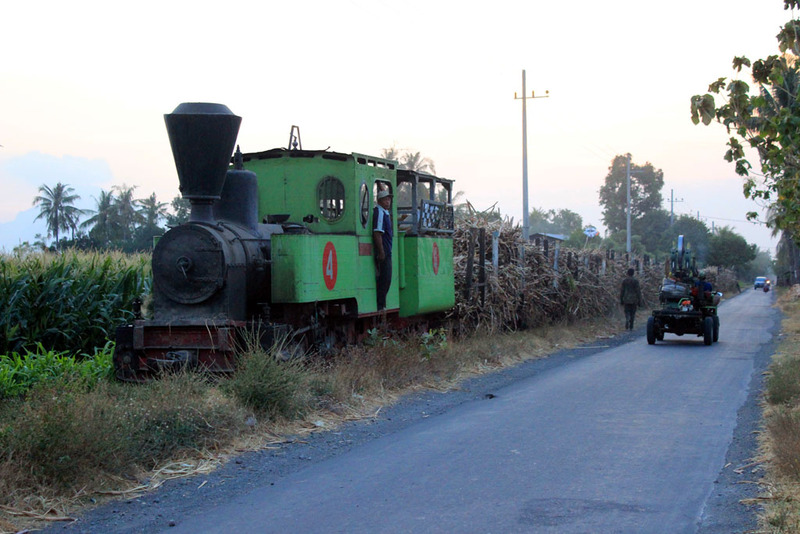 Midway between the mill and the nearest village, we were suddenly greeted by the sight of approaching sugarcane train, hauled by orange locomotive. It turned out to be a returning diesel locomotive. Unfortunately, I failed to photograph the train. Undeterred by the failure, we decided to resume the journey, until Agra shouted to me “Train ahead!” I initially thought he was dreaming, until I saw a greenish shadow ahead, which turned out to be the prime target: a steam loco hauled sugarcane train!! We immediately jumped out of the car, and trying to find the best vantage point. Watching the sight that resembles a bygone era is really magical. Once the train went, we quickly returning back to the car. While I attempted to turn the car around, I almost hit an elderly woman! But thankfully I could resume the chase without additional incident. Since the train running at slow speed, I found it easy to chase after the train, and tried to repeat the photoshoot. I actually able to repeat the shot, while the passing steam truck makes me unaware of one incident that took place: apparently one of the coupler fails! We waited for almost half an hour for progress. But since it’s getting dark, we decided to end the train hunting for the day, and head for some dinner. Situbondo offer very little when it came about culinary, so we ended up eating in one of the restaurant in the town. It is called “Ayam Goreng Pemuda”. 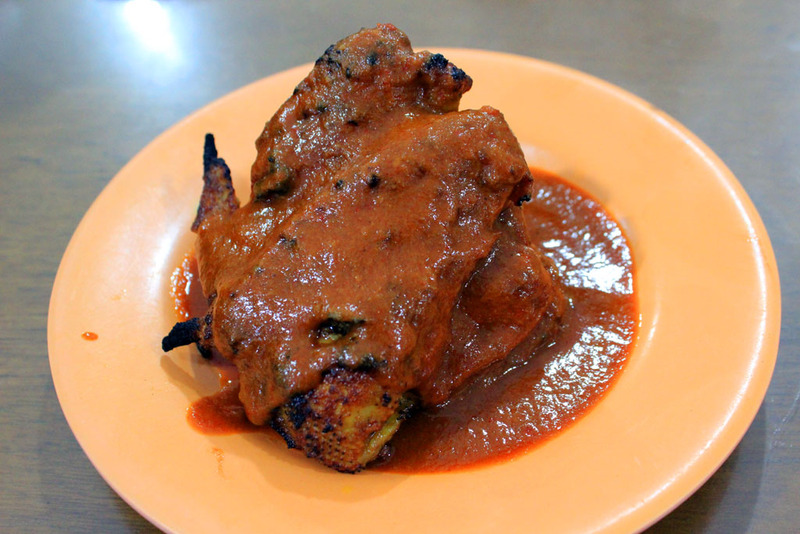 I ordered my “Ayam Bakar Bumbu Rujak” or Grilled Chicken in Chili Sauce. After we finished our lunch, we returning back to the hotel to take a rest.